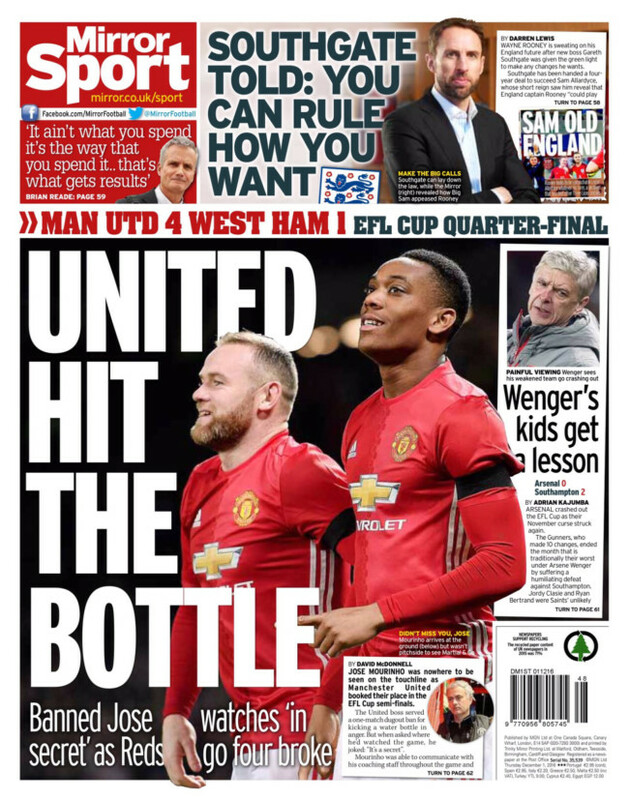 The Mirror says Manchester United want Jose Mourinho to remain at Old Trafford for ‘TEN MOUR YEARS”. United want Jose to “stay for the next decade”. Given that Mourinho has never remained at any club for longer than three years, you might suppose the United headhunters are hopeful, ignorant of what happened with Jose at Chelsea, desperate or a combination of all three. 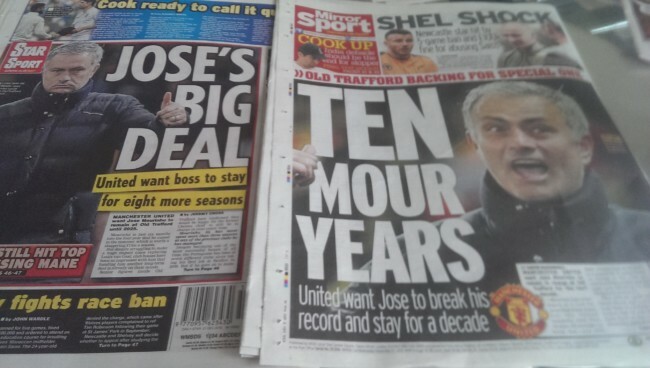 It’s “Jose’s Big Deal”, agrees the Star. “United want boss to stay for eight more seasons”. They “want him til 2025”. A decade is nine years? Journalists never were much cop at maths. Mourinho’s erratic behaviour on the touchline and in press conferences has been a concern to United bosses, as exclusively revealed in Starsport… United also accept the ranting and raving comes with him being one of the world’s ‘box office’ managers. The two stories are remarkably similar. And you won’t be surprised to know that neither story names it source. Wonder if the insider who loves Jose is someone at United or a mole in the office at Jose’s agent? Transfer balls: The Sun leads with news of Manchester United’s £60m bid for Atletico Madrid’s Antione Griezman. It’s an exclusive. But we’ve read of Grizeman heading to United before: here, here and here. The Press have also told us Griezman was joining Chelsea for £50m. They told us he rejected a move to Arsenal and declared that he’d never play in England, not even for £80m. Griezmann “was settled in Spain and would not consider a move to England”, said the Indy. The Sun also told readers that Griezmann, 25, was looking at a release clause worth “£78m”. That release clause, the one worth £78m? Starsport understand that both Manchester giants as well as Chelsea and Arsenal are all interested in signing Griezmann in the summer. The France international is one of the finest players in the world and valued at around £80m but that would not put off any of England’s top sides. Griezmann has a contract with Atletico until 2021 but his relationship with the club and coach Diego Simeone has soured this season. After losing the Champions League final to city rivals Real twice in the last three years, Atletico look like a team which has peaked. From feeling calm yesterday (in his own words) to feeling sour today (in the Sun’s words) it’s been a busy few days for the Frenchman. Transfer balls: a look at the football transfer gossip. The BBC says Arsenal want to sign Borussia Dortmund’s Marco Reus if they fail to commit Mesut Ozil or Alexis Sanchez to new deals. Reus was once the name on very big side’s wish list. 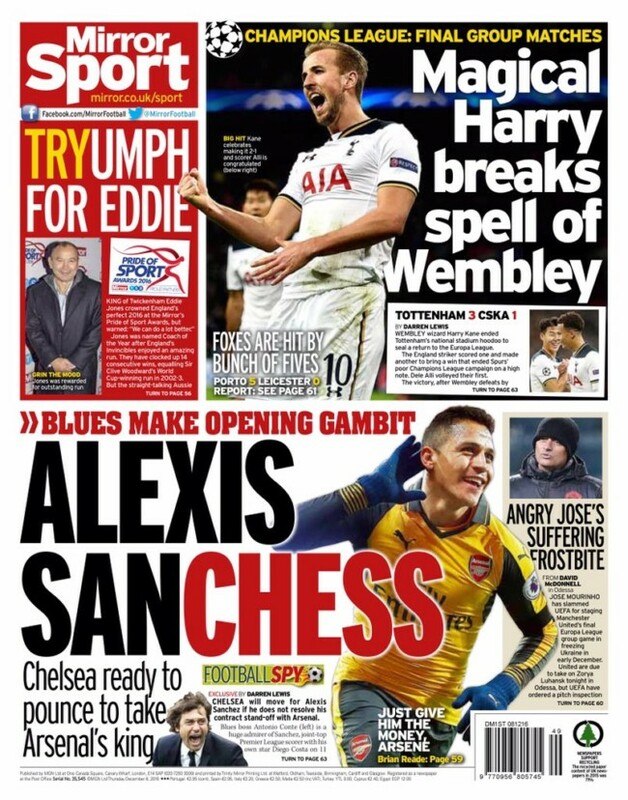 In January 2015, the Metro told its readers: “Chelsea target Marco Reus has snubbed a move to the Premier League to agree to join Real Madrid”. 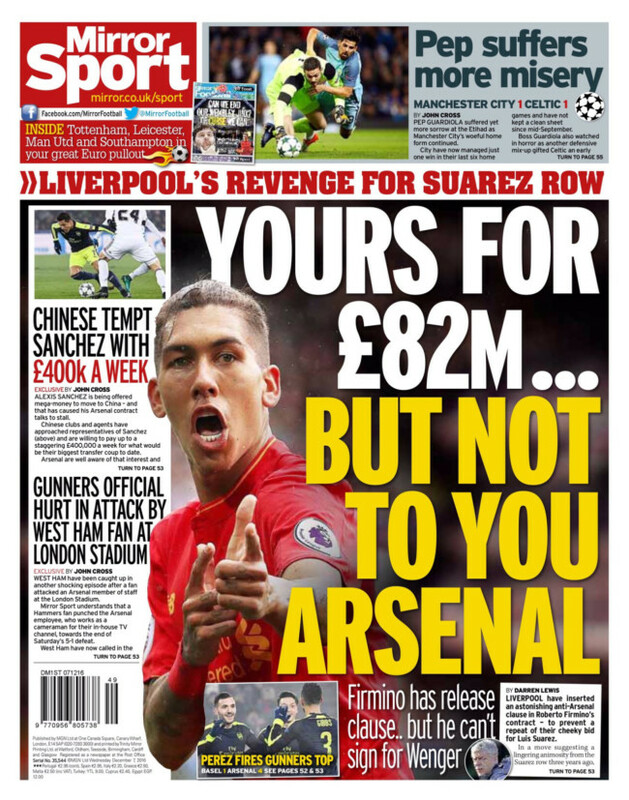 The same paper later said Reus wanted to join Liverpool. He stayed at Dortmund. That the Press have no idea is clear. But the Telegraph says it’s all true. Reus to Arsenal will happen if the Gunners fail to extends Alexis Sanchez’s deal. As Arsenal fans wonder why the club doesn’t buy Reus anyhow the BBC says another old favourite is on the Arsenal radar: Julian Draxler. The Express says the Gunners have scraped together £30m for Wolfsburg’s 23-year-old Germany midfielder. It was back in January 2014, the Mirror reported: ” Arsenal and Schalke agree fee for midfielder Julian Draxler.” They didn’t. In July 2016, the Sun said: “Julian Draxler to Arsenal: Gunners bid £43m for Euro 2016 star.” A few months later and that star has fallen by £13m. If Arsenal can get Draxler or Reus, and secure Sanchez and Ozil on new deals, the future looks promising. But as we’ve seen, nothing is certain. Arsenal lost to Manchester City in yesterday’s battle of the Middle Eastern Airlines – Etihad 2, Emirates 1 – and look well set to secure 4th place, a slot they’ve occupied so many times you wonder when the Premier League will award it to them in perpetuity. But Arsenal manger Arsene Wenger is unhappy. 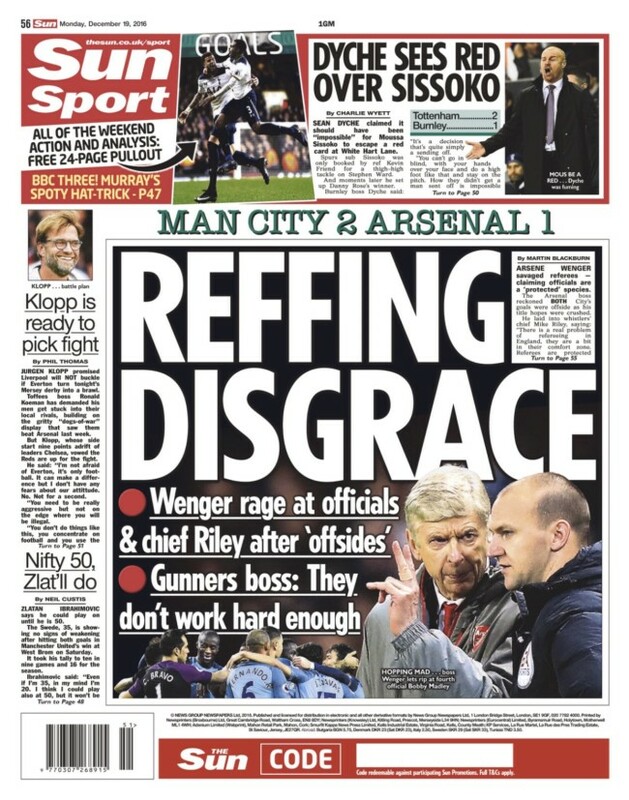 It’s a “REFFFING DISGRACE”, says the Sun as Wenger “rages at officials” over City’s two “offside” goals. The second strike, by Raheem Sterling, was clearly offside. Arsenal goalkeeper Petr Cech says David Silva’s dash into his line of vision – making the Spaniard around 5 yards offside – meant he could not see the shot that beat him at the near post. In “Offside? No way” the Sun lets former ref Mark Halsey rule on the goals. He says Leroy Sane, who scored City’s first, was “fractionally offside”. The story should be headlined ‘Offside? Yes.’ But Halsey decides the officials got it right in getting it wrong. He then says Cech is wrong – Silva’s run across him for goal number two did not interfere with his line of vision. On pages 52 and 53, David Kidd says Wenger is just a moaner, Arsenal are “not fit to lace” Chelsea’s boots and Sane was “onside”. 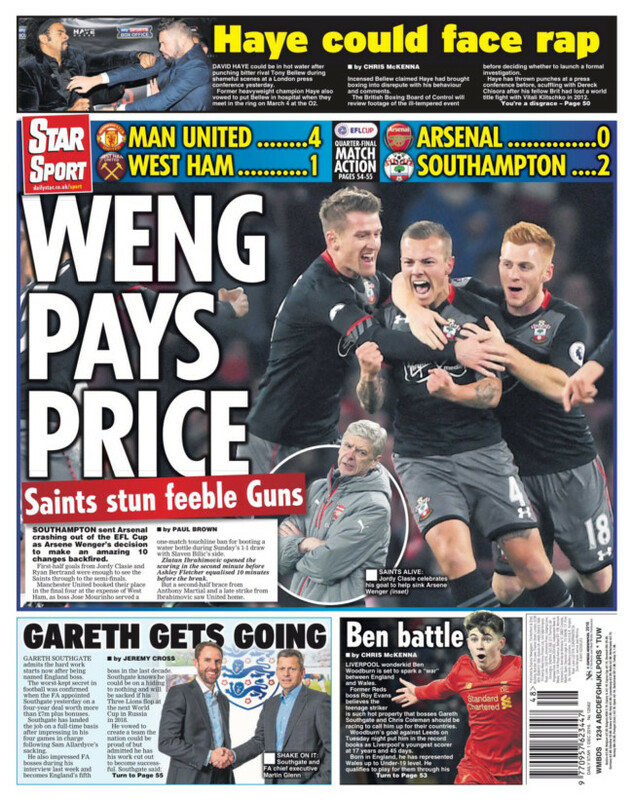 Picking up the “lions” theme, the Star says Arsenal are more “pussycats” than kings of the jungle. The team lack “bottle and fight”. They need a “miracle” if they are to win the Premier League. As ever, says the paper, Arsenal started well and then faded as the home side got improved. Arsenal “shied away from the scrap”. Arsenal’s most expensive player, Mesus Oil “was anonymous”. No. He was worse than that. He was a liability, failing to chase the ball and close down the opposition. Players will run through walls for Chelsea boss Antonio Conte. For Wenger, they won’t step through a puddle. The Express also leads with the match. We read that Leroy Sane was offside and David Silva was “clearly in an offside position – and distracting Petr Cech – as Raheem Sterling fired home the second”. But “there is no excuse for Arsenal’s failure to force a save out of Claudio Bravo in the second half”. The result, says Richard Tanner, underlines the “difference in attitude” between the two sides. Manchester City wanted it. Arsenal not so much. For that lack of desire, the club must look at Arsene Wenger. Can he still inspire his team to the title? No. Can he make more money for the bankers who run the club as a cash cow? Yes. So why agree to an interview with Sky? Is this interview part of Sanchez’s negotiating tactics? To the Sun this is a “shock ultimatum”. Sanchez just wants money. Lots and lots and lots of money. If Arsenal pay him what he wants he’ll kiss the badge. If not, 100 men and a dog (sandwich) will get the befit of his brilliance in the Chinese Super League. 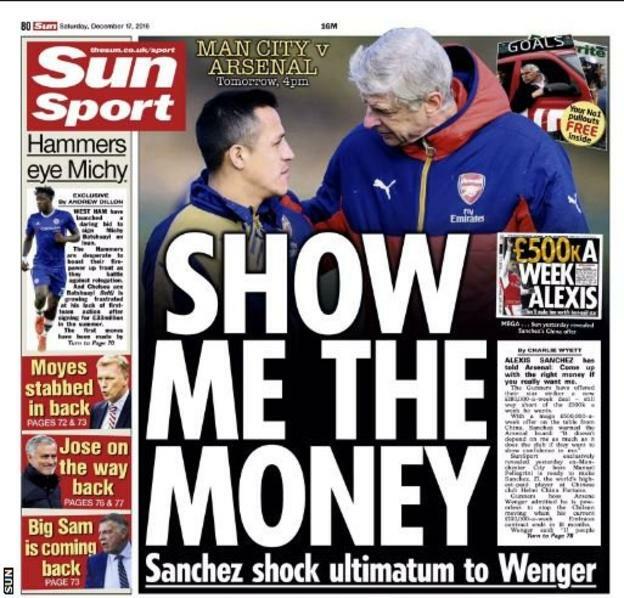 The Sun’s “Show Me The Money” headline makes Sanchez sound like a greedy so-and-so. But football is all about the talent getting their dues. If he’s worth it, Arsenal will need to cough up. The Mail says the club have offered him £180,000-a-week. He wants £240,000. And if Arsenal wants to win the big tin pots, too, they’ll have to hang on their prize asset. As with Robert Snodgrass, the Hull City player who dived to win a penalty against the luckless Palace, Zlatan is at pains to construct a sympathetic back story for his offence. We see his hand move towards the ball, but Zlatan presents his body as the benign victim of a molesting force, which only touched his hand a little. And just like in Hollywood, Zlatan has his people to protect him. Compare and contrast these match reports. Matta clipped it into the area where Ibrahimovic, with a hint of handball, used his torso to nudge the ball onto Pogba, who despite being slightly offside was allowed to continue his celebrations after he poked it past Hennessey from close-range. With just seconds remaining before the break, the Reds’ patience finally paid off, as Ibrahimovic chested Mata’s free-kick into Pogba’s path, allowing the Frenchman the easiest of finishes from six yards. More on the news that when a Manchester United fan who hates Liverpool lays into a Liverpool player as part of his job as a Sky TV pundit, the Liverpool manager might get a tad miffed. And so it is that Jurgen Klopp thinks Gary Neville is a bit of a wally in his harsh criticism of Reds’ goalkeeper Loris Karius. For good measure, Gary’s brother Phil opined from the BBC sofas that Karius, who had spoken to the Press about Gary’s criticism, should “keep his mouth shut and do his job”. “I don’t care what Gary Neville says,” said Karius in reply to a question from Mail journalist Ian Ladyman. “He was a top player, then was a manager for a short bit and now he is back to being an expert again.” Karius was making reference to Gary Neville’s failure as manager of Valencia, a team owned by the former Manchester United man’s mate. Ladyman says Karius was “not animated or emotional”. He was “just being gown up”. Agreed. He came across well, refusing to hide after his howler had given Bournemouth victory over his side. Phil Neville was not neither measured nor insightful in his response. He simply told Karius to “shut up”. As punditry goes, Phil is very much in Gary’s shadow. Working in the media is about taking part in a conversation. Phil is advised to keep the chat alive rather than putting it in a bland box and sitting on the lid. The Press laps it up, making the row the lead sports story. 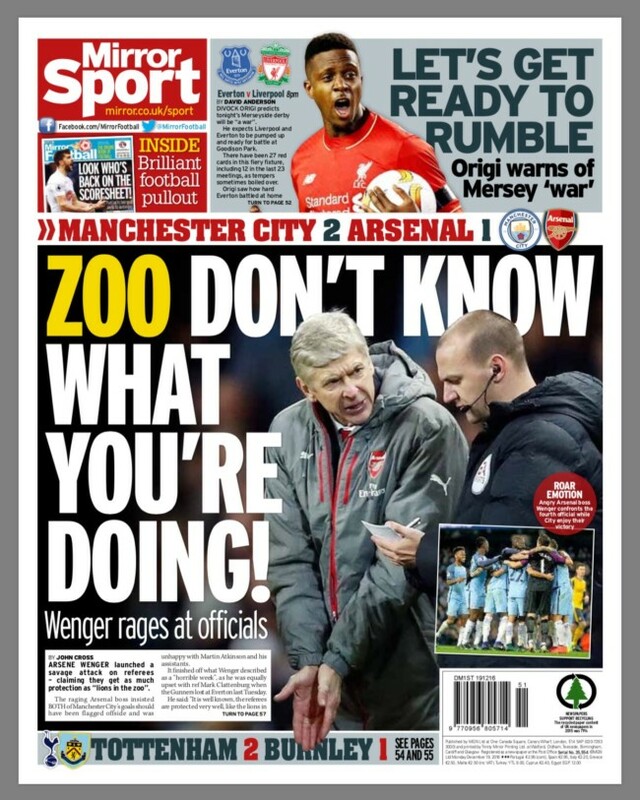 “YOU FAILED SO SHUT IT,” thunders the Mirror’s back page. “KLOPP has POP,” puns the Mail’s. “Klopp has launched a double-blast at the Neville brothers,” says the Sun. “Angry Klopp blasts Neville,” says the Star. And all the while the BBC and Sky celebrate good old fashioned journalism. “I am absolutely not interested in creating headlines so you can write what you want,” said Klopp. He isn’t. But Gary Neville is. And he’s making a grand job of it. Butcher says it was definitely a foul. But might it have been worse? The BBC’s Kevin Killbane says “Granit Xhaka goes over the top on Joe Allen.” Other news sources see an elbow. Did Xhaka mean to use his elbow? Both Stoke sources ask questions of Xhaka, who wasn’t booked. Maybe the referee missed the elbow? Let’s see what the local Arsenal newspaper said. It was a simple collision, says the Arsenal website, “an accident that happens when two players hit each other with force. The last words are with the managers. One Watch: a look at media corruptions of Jose Mourinho’s self-billing as The Special One. Yesterday, Mourinho’s Manchester United were in Ukraine for a Europe League match they won 2-0. Anyhow, add ‘The Frozen One’ to the list. 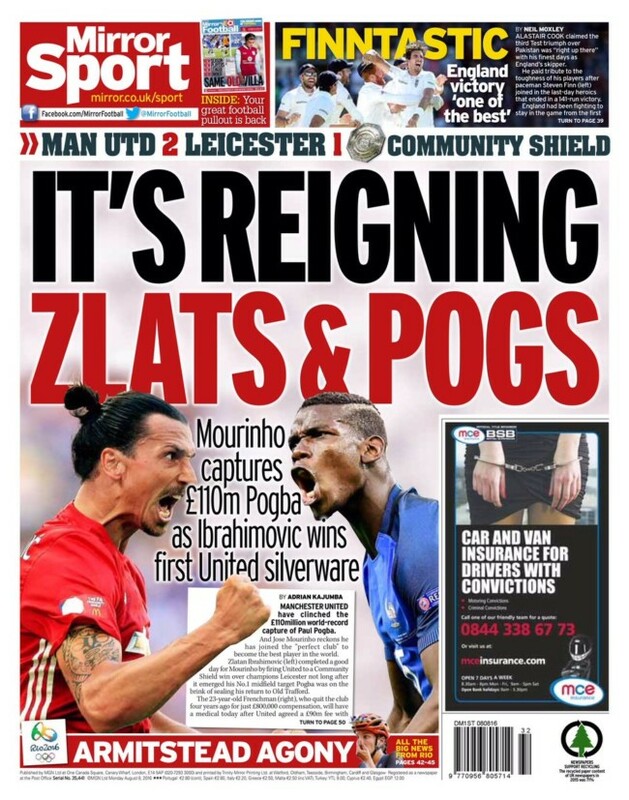 Manchester United players show Daily Mirror readers “the most modern football thing you’ll see today”. More modern than Atletico Madrid’s new stadium being named after a chain of Chinese cinemas? The new gin bar at Fulham? The clickbait balls that mean all newspapers now look the same? Is this a “a step too far?” wonders the Mirror. No. It’s a pillow. It suggests the onboard flight is not as comfortable as it might be for elite athletes returning from a Europa League match. It was different back then, of course, when United players rested their heads on blocks of wood and coal dust. Arsenal transfer news is all over the tabloids. With just 18 months remaining on there respective contracts, Alexis Sanchez and Mesut Oil are haggling for new deals and lots more cash. Are they going or staying? The media knows nothing, of course. The media had no clue either player was on Arsenal’s radar before they arrived and has no clue if they will sign a new deal. That’s only right if you take half of what he said and ignore that bit about him wanting them to stay for longer and the 18 months being the only agreed element of the deal. Six pages inside the paper, readers get a fuller quote. They also learn that Ozil has been offered £200,000 a week, a hug increase on his current £140,000-a-week deal. 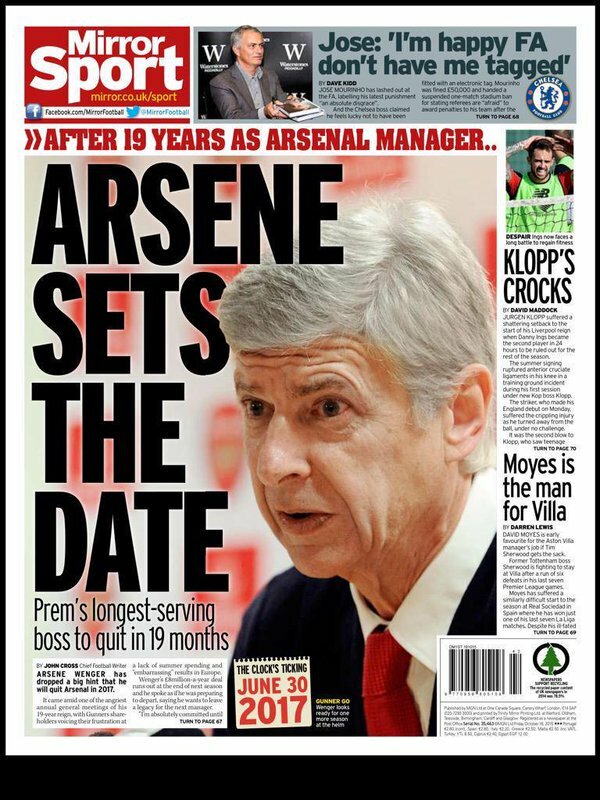 The Mirror, of course, knows precisely what is going to happen, it having told us that at the end of this season, Wenger is leaving the club on June 30 2017. Over in the Sun, it’s “FLY EMIRATES”. Wenger “admits he cannot guarantee” Ozil and Sanchez will stay at the club. Not quite. They play for Arsenal, and must continue to preform at the highest level to prove their value. Football’s not about contracts. It’s about teams. Football is not a means to an end. Top sport isn’t. It’s about doing your best and enjoying yourself. The incessant tabloid guff about money and contracts in football creates an impression that all footballers are disloyal and driven by money. To think Ozil and Sanchez think of bonuses when they score win or lose is to do them a disservice. We get stories that Sanchez could earn £400,000-a-week playing in China. No word on whether he wants to or sees a new challenge in the Far East. Just the money. Do they want to play for you? Would they enjoy it? Agents are employed to maximise their clients’ earnings. But they also know that a happy client is a retained client. The agents don’t hold all the cards. It’s a balance. If Ozil and Sanchez’s agents are the top of the game they will strive not only for money but for their clients’ futures. Are they better off at Arsenal, where they are thriving and earning a fortune, or should they head o China, Chelsea or wherever else will give them more money? Still think he’ll leave? No. Me neither. Spurs’ Argentinean manager Mauricio Pochettino was invited to consider the incident. Did Alli dive? An accidental dive is a nice take on the non-denial denial. Dele latched onto a ball down the left-hand side of the area and was clipped by Naughton, with referee Jon Moss pointing the spot after a moment of consideration. The game was goalless when Dele Alli induced referee Jon Moss into giving a penalty when the Spurs midfielder appeared to go over with no contact from Kyle Naughton. Spurs finally took the lead on 38 minutes. Kyle Naughton caught Deli Alli’s [sic] trailing leg in the box and referee Jonathan Moss awarded a penalty. Such are the facts in the biased media. Arsenal tonked West Ham united 5-1 at the Hammers’ soulless Olympic Stadium – hear the Arsenal fans singing “Is this the Emirates?” – and the tabloids are full of speculation. Is West Ham manager Slaven Bilic soon to be sacked? “Bilic’s job is not under any immediate threat,” adds the Mail. In short: nothing has changed. Bilic is the West Ham manager. Southampton fans looking for reports on their team’s 0-2 victory away to Arsenal in the League Cup will disappointed to see their team get second or ever third billing to the Gunners boss Arsene Wenger. The crux of the match report is that Southampton less won the match than Arsenal lost it. Arsenal’s Wenger made 10 changes to the team that beat Bournemouth last weekend. Southampton’s Claude Puel made eight changes to the team that beat Everton. Given that the Gunners could still all upon a wealth of experience in the expensive legs of Aaron Ramsey, Kieran Gibbs, Gabriel, Lucas Perez, Xhaka and Alex Oxlade-Chamberlain, a player signed from Southampton’s prodigious academy for £17m, Southampton deserve more plaudits. They did not defeat Arsenal’s “kids”. They beat a wealthier team on their home patch. 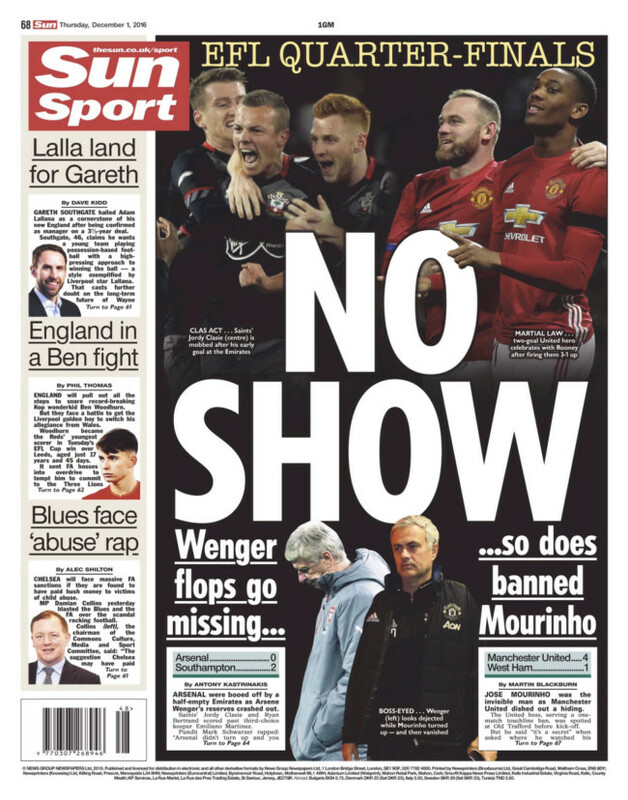 For the Sun to says on its lead sports page, “Arsenal didn’t turn up” is absurd. In his £250m splurge, LVG made two that excited but could not get the best out of either in Angel Di Maria and Memphis Depay. Mourinho has made four and so far Zlatan Ibrahimovic, Paul Pogba and Eric Bailly have been immediate hits. Another reasons: “NEW SIGNINGS STRUGGLING.” So much for Mourinho’s “immediate hits”. Next question is one of ours: Would Manchester United fans prefer to have signed Jurgen Klopp or Pep Guardiola instead of the chippy Mourinho? 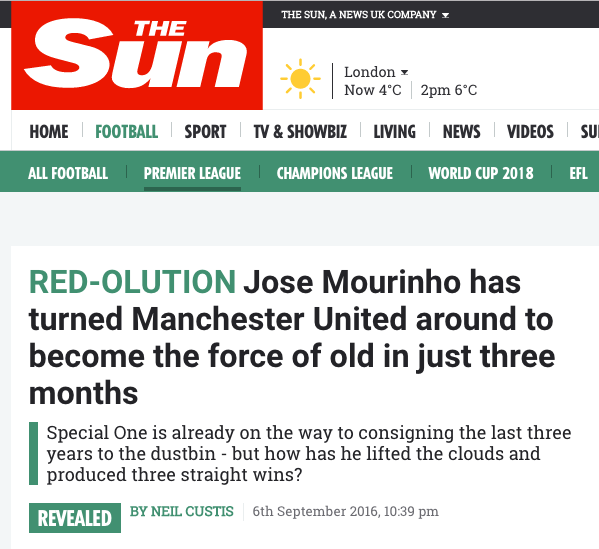 Over in the Mail, you can read: “Inside the troubled World of Mourinho – An obsessive man at odds with himself and his players.” So much for the RED-VOLUTION.